The value of immaterial things in the shadow of capitalism is the central idea of the film, which was directed by Hiro Murai and written by Glover’s brother Stephen — both longtime collaborators on Atlanta and elsewhere —and which has been shrouded in secrecy since filming first began in Cuba. At a spry 55 minutes, it seems to want to emulate that kind of ephemerality itself. The cinematography is grainy and cozy, like a sun-faded t-shirt; at times it feels like a lost student film that’s been languishing in someone’s basement for decades. It’s easy to imagine a more beefed-up version of it, especially given its semi-mythical setting and storyline. But it purposefully lacks that kind of bombast, mostly tracking Deni’s crisis of conscience as an artist working under the thumb of the local captain of industry until it inevitably ends in tragedy. Deni, who appears to make a living singing on the radio and writing jingles for local businessman Red (Nonso Anozie), has promised the island’s workers a music festival in the coming days. He envisions a music and dance-filled night off for everyone, a break from their jobs at the silk factory. But the big boss Red forbids it, not wanting to lose a day of labor from his workforce. With a death threat hanging over his head, Deni forges on anyway, while Kofi frets, sometimes confiding in her friend Yara (Letitia Wright). Along the way, there are a handful of musical numbers, including a reworking of Glover’s hot-button viral hit “This Is America,” reimagined in a loading dock at Red’s factory. It’s a response to a coworker’s longing to save up and move to America so he can “be his own boss.” The Childish Gambino song becomes a kind of current-day rejoinder to the American dream in the way “America” was for the Puerto Rican immigrant characters in West Side Story. The idea, of course, is that Guava Island is a microcosm of America, and that America is no more abundant with opportunity than this tiny, mono-industrial island. 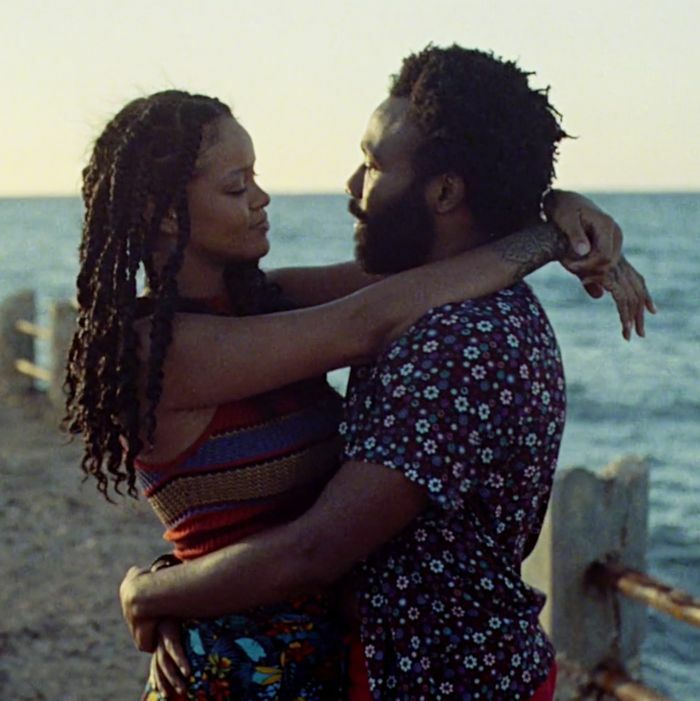 The Glover brothers and Murai have, as ever, no shortage of big questions and ideas to build their stories around, and a line uttered by Rihanna to Anozie in the film’s finale underscores the onstage sentiments of both Deni (at his festival) and Childish Gambino (at Coachella). Why then does Guava Island feel so small, and Glover’s Coachella appearance feel so huge? One took, presumably, more logistical planning than the other — a feature(ish) film shoot and a musical set are vastly different undertakings. In this case the ideas feels diluted in the former, despite the latter being accompanied by the good folks at AEG and the stunty reveal of a limited edition collaboration between Glover and Adidas. One feels like a melancholy hang with characters we never really get a chance to know, the other like an existential emergency.